OAKLAND, CA -- Draymond Green emphatically flexed his bulging biceps with big plays on both ends of the floor, and these determined Golden State Warriors might be far too strong for the Cleveland Cavaliers. The repeat championship Golden State has spoken of since the very start more than eight months ago is suddenly two wins from becoming reality. That's the only way the Warriors' record-setting season will feel right. Right now, they sure seem unstoppable. 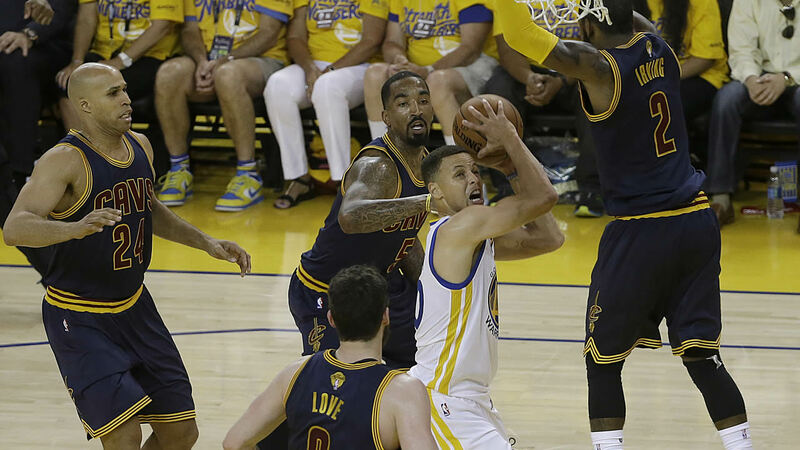 Green had 28 points, seven rebounds and five assists, while MVP Stephen Curry scored 18 points despite foul trouble, and Golden State thoroughly overwhelmed the Cleveland Cavaliers 110-77 in Game 2 of the NBA Finals on Sunday night. The 33-point win was the Warriors' most lopsided ever in a finals game. "I'm definitely surprised at the margin of victory tonight," coach Steve Kerr said. "It happens in the NBA, sometimes things get away from you. Sometimes shots go in, sometimes they don't. ... Everything changes when we go to Cleveland, we know that." Once the Splash Brothers found their shooting touch, Cleveland couldn't keep up. Klay Thompson got hot after halftime to finish with 17 points and five assists as Golden State became the first team to go ahead 2-0 in the finals since the Lakers in 2009 against Orlando. "What we've done the last few years, everybody, every night has an impact," Curry said. "You don't know where it's going to come from any given night. We've got to keep our focus and our edge and hopefully get two more." Now, the series shifts to Cleveland, and LeBron James and the Cavs must show up for Game 3 on Wednesday in front of their title-starved fans down 2-0 to the defending champs and with forward Kevin Love dealing with a head injury. The NBA said Love experienced dizziness early in the second half and left for the locker room to be re-examined, then was placed in the NBA's concussion protocol. The league said he didn't exhibit any symptoms before then, even after taking an elbow to the back of the head from Harrison Barnes in the second quarter and going down for several minutes before returning following a timeout. He made a baseline 3-pointer for the Cavs' first basket in nearly 5 minutes. After a scoreless first quarter when he missed all five shots but had five assists, James scored 14 of his 19 points in the second and also finished with nine assists and eight rebounds, but seven turnovers. James' teams had won nine straight postseason Game 2s after losing the series opener dating back to a loss in the 2008 Eastern Conference semifinals to Boston. After Curry and Thompson combined for only 20 points in Thursday's 104-89 Game 1 win on 8-for-27 shooting and the bench carried the load, they each hit four 3-pointers and went 13 for 24. Leandro Barbosa had three straight transition layups in the third quarter and scored 10 points for his first back-to-back postseason games in double figures since 2008. The Warriors' 87 victories combined from their record 73-win regular season and the playoffs matched the 1995-96 Chicago Bulls, the group Golden State topped for the most regular season victories in NBA history of 73. Andrew Bogut had four of his five blocks - Golden State had nine overall - in the first 7:15 and received a standing ovation when he came out at 3:50 in the first then went to the locker room late in the quarter. He hit his hand on the rim early and grimaced in pain. Andre Iguodala, the 2015 finals MVP, took another hard hit to the groin in the first quarter on an offensive foul called against James, causing the Warriors forward to grimace in pain. Matthew Dellavedova got Iguodala in the same area in Game 1. A moment of silence was held for late boxing great Muhammad Ali, who died Friday night at an Arizona hospital. Photos of Ali showed on the main scoreboard ahead of the national anthem. Cavaliers: James' career-best 25 straight postseason games scoring 20 or more points was snapped. ... James played in his 194th postseason game, passing Karl Malone and Danny Ainge (193 each) for 10th place on the career list. His first-quarter steal also moved James past John Stockton (338) at fourth place for career postseason steals. Warriors: Bogut's four blocks in the first were the most in one finals quarter since Ben Wallace's five for Detroit during Game 3 against San Antonio in 2005. ... Green became the fourth player in Warriors history with 500 rebounds in the postseason, joining Wilt Chamberlain, Nate Thurmond and Clyde Lee. Green also has a steal in 20 straight playoff games. ... Golden State is 3-5 all-time in Game 2 of the NBA Final and 3-2 at home, including a 95-93 overtime loss to the Cavs last year. ... The Warriors committed six turnovers in the first quarter alone after having only nine all of Game 1. Which player had the best sneakers of Week 23 in the NBA?